Our water well pump installations services will get your water well operational with our great well pump services packages, keeping it operational. If for any reason you have any questions or comments about a water well pump installation, feel free to give us a call at 888-769-9009 or fill out the form to the right and a representative will respond shortly. A water well pump installation is something you want to get done right the first time and our knowledge of trusted brands, proper motors, and water well pump installation service that is the finest around Chicago. In the event water is required while your equipment is being repaired, we offer temporary or permanent well pump installations because we maintain a large inventory of test pumps up to 500Hp that and be installed on a temporary or permanent basis. Although a water well pump installation appears simple, in reality they are very complex and an owner should never attempted to pull their own pumping equipment. 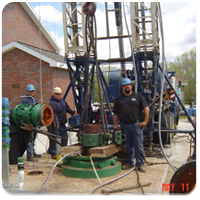 Our water well pump installation services are very reasonably priced compared to our competitors and we can ensure that your water well pump installation is done correctly and that your pump meets all state and local water well codes. If for any reason you have any questions or comments about a water well pump installation, feel free to fill out the form to the right and an associate will respond shortly or give us a call at 888-769-9009.